The Beer Academy Sommeliers held their first annual reunion at the Parcels Yard at Kings Cross Station. Only a year after the creation of the qualification, there are already 24 Sommeliers across the UK and internationally. The Sommeliers used the reunion to share their ideas and experiences on how best to educate and inspire people about beer. Beer Academy Sommelier Craig Steven said “It was the first time that I had met my fellow Sommeliers and I was amazed by the breadth of their different skills and interests. 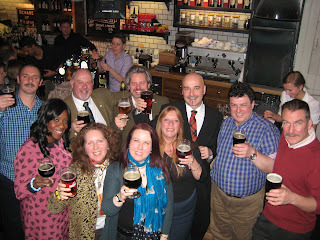 There are brewers, pub owners, beer writers, bloggers, beer event organizers a professional beer taster and Nigel Sadler who probably fits into all camps! They had a wealth of stories on how becoming a Sommelier had opened doors to spread the word about beer.